Marcia dei Marti Rós; Sòpa (Zoppa); Mazurca de Marcello; Polka de Ciù; Valzer Dino; La m'va benone; La Paris; Ciuffetto; Mazurca dei Marti Rós; Monfrina de Ciù; Polka dei Marti Rós; Polka de Marcello. The four monfrine dances are danced outside the official Compagnia, at any appropriate social situation, usually in the bars in the evenings, by both sexes. They share the 12/8 time, bipartite form, rant step, rhythm and melodic structure of the other dances, but have no specific figures. Except for La bella inglesina (better known as La e Mi), they have come down without names. One - now known as either Monfrina de Ciù or Sol e Do, has always been played, but the other two, although remembered by the older fiddlers, had not been danced for years. They were first collected in 1977 and reintroduced in the early '80s, and called Monfrine de Marcèlo (Nos. 1 & 2) for Marcèlo Buccio who handed them down. In 1998 another tune was added to the repertoire, a monfrina known as La m'va benone (It's going really well) because of its sung final B music line, using these words. It was added to La Sol e Do to make a longer medley of two rather short tunes - useful for the social dancing. It also makes a rousing finish to the set - and gives everyone the opportunity to sing the refrain. That was written in 1998; in the subsequent 10 years, further tunes which had been part of the traditional repertoire of the valley have come to light. Most had been uncovered by the research work of Gaetano Salvini, Lorenzo Pelizzari and Bernado Falconi, staring in 1977 but, unsurprisingly, it was the ritual tunes and their dances which were of the most interest ... and it was these that were reintroduced to the repertoire of the ballerini. The other tunes were to an extent side-lined, though not forgotten. For reasons not made entirely clear in the liner notes - probably the interest of some of the younger musicians now playing the in the band - this alternative, non-ritual repertoire has recently been undergoing a revival. It would appear that Marco Buccio, grandson of Marcello Buccio, one of the main sources of the tunes, is largely responsible. A repertoire of some 20 pieces has been collected together - 10 of which came from the early-Eighties recordings, the remainder coming from the memory of the oldest fiddler in the compania, Andrea Bordiga (Andreino Tòfen dei Bagòs). Most of the tunes are said to be 'from the old liscio repertoire' and include marches/polkas, waltzes, mazurkas and tangos. The instrumental groups which played these tunes were of similar make-up to the ritual bands, but with the addition of a mandolin - thus, typically, two fiddles, mandolin, two guitars and a bass. The first fiddle plays the melody, the second plays a harmony, mainly in thirds; the mandolin alternates reinforcing the two fiddle voices, sometimes in a higher octave; the guitars and bass take the rhythmic and harmonic role. As I indicated in my 1998 piece, the interest in the Ponte Caffaro carnevale ritual from the local people had begun to escalate, and this has continued to the present day; there have been as many as 80 dancers towards the end of the Tuesday (Martedi Grasso) and, unsurprisingly, the number of musicians wishing to be in the band has also increased. This year, there were two separate bands playing - one for the adults and one for the children. The band heard on this CD may be seen as the nucleus of the group which has played for all the dancing in previous years, and is basically the same group which came to Sidmouth a few years ago, and to Shropshire in 2006. The 12 tracks represent a little over half of the non-ritual repertoire which has been recovered. Today, it is these tunes which are played in the bars in the evening after the day's dancing is over, in preference to the ritual dance tunes they have been playing all day. The CD's booklet (only in Italian) gives all this information and a great deal more, including details of what was collected from whom, and makes this a superb piece of academic research - for which all concerned are to be congratulated. However, the music is far from academic; like the previous CD of the ritual music it's wonderfully played, hugely energetic, and loads of fun. And there are some equally great tunes here ... interestingly, one of them, Marcia dei Marti Rós seems to have come to the Valley with a returned emigrant to America - you'll probably know it as Redwing! Some favourites of mine which will serve to give a taste of this great repertoire include Mazurca dei Marti Rós and Polka dei Marti Rós, both of which came from Martino and Stefano Bordiga, known as 'Nosièncc dei Marti Rós', who also gave the compania its last ritual dance, Fiorentina. 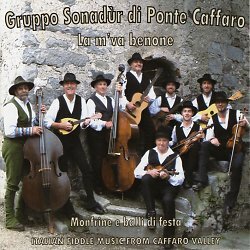 Since this CD was intended primarily to give the repertoire back to the people of the Caffaro Valley, it's not easily available in the world beyond. So MT comes to the rescue, and the CD is now available from our Records website. If you've bought and enjoyed the other Ponte Caffaro CD, Pas en amùr, you'll certainly want this, too.